Looking at nearly 20 million reviews from a mix of learners on Cerego, we discovered that our most successful users followed a distinct pattern. By continuously modeling the strength of every memory in the system, Cerego’s algorithms can predict the accuracy for each review - and measure when learners consistently perform above or below those expectations. Those learners who spent around 3-5 minutes of learning per study session, or around 25-40 quiz trials, tended to perform above expectations, learning faster and more efficiently than those who spent shorter or longer. Not all content is equally difficult! Learning new material was harder than reviewing previously-learned concepts: the optimal number of new concepts to learn in one sitting was around 10. On the other hand, learners could efficiently review about 20-25 concepts from their existing knowledge before performance began to decline. It may not seem efficient to learn 10 things and walk away. The good news is that we don’t have to: a short break between sessions was enough to allow learners to recover cognitive control. 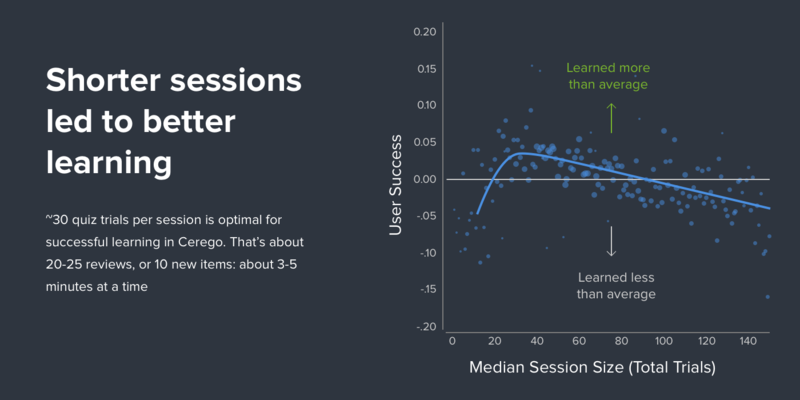 In other words, learning from 2 sessions of 10 items each, with a short break in between, led to better retention than learning all 20 items in one sitting. This is consistent with research demonstrating that even a brief diversion from a goal-directed task can allow us to refocus productively on that task for a prolonged period (Ariga & Lleras, 2011). There are clues in the data about why these short breaks might improve retention. We know that desirable difficulty, and the deeper cognitive processing it encourages, are crucial for building lasting and transferable knowledge. It is significant, then, that learners considered quiz questions more carefully earlier in their session. As learners complete more quizzes, they tend to compensate by spending less and less time on each one, reducing learning. A short break in between sessions can help sustain focus and improve retention. Based on our findings from this analysis, Cerego adopted a data driven approach to the learning sessions we encourage. 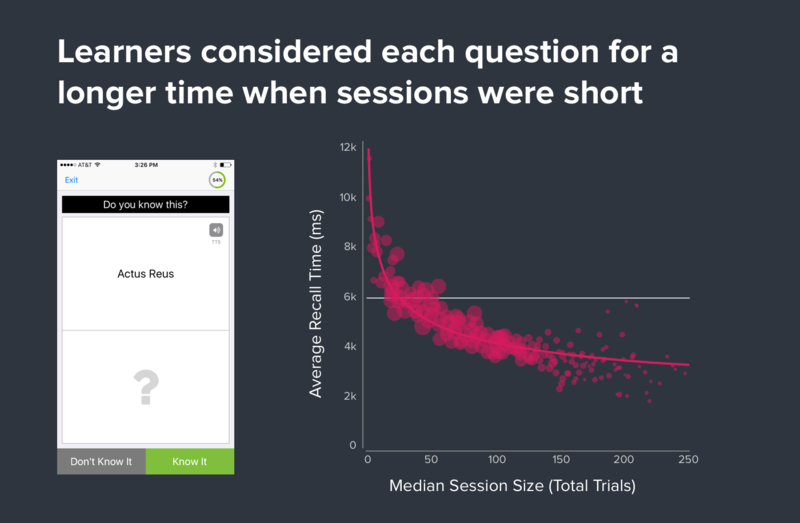 Our redesigned experience includes a smart learn button that generates a bite-sized learning session, corresponding to the length of time our most successful and effective learners follow. The new smart learn button also calculates the best order to tackle your concepts in each session, with desirable difficulty in mind. Generally, this means you’ll see newer or more challenging concepts early in each session, when you’re most able to learn them effectively - though you can always opt to simply review old concepts, if you prefer. Productivity research has gained momentum in the last few decades, especially as businesses realize that working longer may in fact not be as efficient as working smarter with frequent breaks. Time tracking apps such as DeskTime, Focus Booster, and Pomodoro Timer have sprung up to help workers support this behavior. We see similar benefits to learning, by encouraging short bursts rather than long stretches. Integrating this approach into our platform is just one more way we can help learners get better results from their time spent in Cerego. Ariga, A., & Lleras, A. (2011). Brief and rare mental “breaks” keep you focused: Deactivation and reactivation of task goals preempt vigilance decrements. Cognition, 118, 439-443. McVay, J. C., & Kane, M. J. (2010). Does mind wandering reflect executive function or executive failure? Comment on Smallwood and Schooler (2006) and Watkins (2008). Psychological Bulletin, 136(2), 188-197. Interested in how Cerego could help you? 19.04.17 Why Learn It When You Can Google It?